As part of my research on Nigerian football I have kept records of all full international matches played by Nigeria since 1996. In this post I will present the players from the Nigeria Premier League 2010-2011 who have at least one full international match for Nigeria. It is almost impossible to avoid mistakes in such a list and when I have written “Full international matches” in Italic it implies that the player could very well have played at least one additional match. Please notice that only international matches approved by FIFA have been considered for this list. Also notice that I have only added players that I know have played at least once, or been at the bench at least once, during the current campaign of the Nigeria Premier League. The picture is of Valentine Nwabili and is taken from MTN Football. Adegoke’s latest match for Nigeria was against DR Congo on 03.03.2010. Adegoke is an experienced left-back who is known for his pace and his effectiveness from set pieces. Adegoke has been injured for almost the entire 2010-2011 season but will most likely force his way into the first team of Dolphins FC during the next couple of months. Adegoke is a former player of Lobi Stars FC, FC Saint Eloi Lupopo (DR Congo), Heartland FC, ASEC Mimosas (Ivory Coast) and Enyimba FC. Central defender Akabogu, most likely born in 1980, played a friendly match against Egypt on 25.11.2002. Akabogu was unfortunately involved in a horrendous car crash in December 2010. Akabogu is a former player of Enyimba FC. Amaefule played for Nigeria against DR Congo on 03.03.2010. Amaefule is a versatile strongman who successfully has been used as a central defender this season, although he traditionally has played as a striker. Amaefule played professionally in Poland and Greece before returning to Nigeria in 2007. He signed for Sharks FC before the 2008-2009 season after a stint at rivals Dolphins FC. Amaefule is a key player for Sharks FC and has scored two goals in the current campaign. Anyanwu played for Nigeria against South Korea on 11.08.2010. Anyanwu is a regular player for Enyimba FC, primarily at center back. As far as I know, Baita’s latest match for Nigeria was against Angola in a World Cup Qualifier on 20.06.2004. Baita played professionally Paris Saint-Germain FC(France), RAEC Mons(Belgium), KAA Gent(Belgium) and National Bucuresti(Romania) before joining Wikki Tourists FC in 2007-2008. He signed for Kaduna United FC before 2010-2011 and is currently an important attacking player at the club and is experience is valuable to the young team coached by Maurice Cooreman. Baita has scored one goal during the Nigeria Premier League 2010-2011. Bassey is widely regarded as the best goalkeeper in the Nigeria Premier League. He is a very confident player who joined Heartland FC before the current season after several good seasons at Bayelsa United FC. He is currently facing a misconduct ban from the Nigeria Football Federation. Bassey played for Nigeria against DR Congo on 03.03.2010. Ebiaku played for Nigeria on 16.06.2001 against Namibia and is currently part of Shooting Stars FC. Ebiaku is a former player of Bendel Insurance FC and Nasarawa United FC. Ehiosun was presented in my post from 12.02.2011. According to many sources, Ehiosun will sign for Norwegian side Stabæk IF during the next couple of weeks. Ehiosun was a trialist at the club in January 2009. Ejiogu is a brilliant goalkeeper but because of John Lawrence’s heroics he is currently struggling to win back the number one shirt at Enyimba FC. Ejiogu is a former player of Julius Berger FC and Dolphins FC. As far as I know, his latest match for Nigeria was on 22.10.2004 against Ecuador. Ejiogu has been a regular member of Nigeria B for several seasons. Eromoigbe started the season at the bench of Warri Wolves FC but recently joined Anorthosis Famagusta (Cyprus). For several years Eromoigbe played for Bulgarian top side Levski Sofia. His last match for Nigeria was against Ghana on 03.02.2008 in the 2008 African Nations Cup. Ezeji is arguably the most effective striker in the Nigeria Premier League. He has currently scored six goals during the current campaign. Ezeji is a strong and intelligent striker who had an unsuccessful stay at Club Africain(Tunisia) in 2007. He has mostly been based in Port Harcourt, playing for both Dolphins FC and Sharks FC. According to my records, his last match for Nigeria was against Libya on 20.10.2004. Ezenwa is a powerful striker who is currently part of Ocean Boys FC. He has scored once during the 2010-2011 Nigeria Premier League. Ezenwa is a former player of Akwa United FC, Enyimba FC and El-Kanemi Warriors FC. His last match for Nigeria was apparently on 20.11.2002 against Jamaica. Ezimorah has pretty much been a fringe player at Sharks FC this season, most likely due to injuries. He played for Nigeria against DR Congo on 03.03.2010. Gabriel is widely regarded as the best defensive midfielder in the Nigeria Premier League. He has a big engine and described as a player with great staying power. He is also a good ball winner and packs a good shot. Gabriel has been on several trials during the last couple of months and will most likely leave Kano Pillars FC during the current or the next transfer window. His age is a bit uncertain but Gabriel was member of Nigeria U-20 during 2008 and is born in 1991 according to MTN Football. He played for Nigeria against DR Congo on 03.03.2010. Kingsley is described as a creative player with speed, skills, excellent passes and a good shot. Kingsley started the season at Kaduna United FC and scored one league goal before he apparently signed for Lobi Stars FC in January. This is however not confirmed. Kingsley is a former player of Heartland FC, Enyimba FC, Shooting Stars FC, Sharks FC and Bendel Insurance FC. His last match for Nigeria was apparently on 20.11.2002 against Jamaica. This flying right winger is a key player at Heartland FC and has scored three goals so far this season. Kofarmata is a former top goalscorer at Kano Pillars FC. The pint-sized player is always a handful for defenders with his lightning speed and directness. He played for Nigeria against DR Congo on 03.03.2010. The experienced and versatile defender was voted as one of the top 10 defenders in the 2005 Nigeria Premier League in January 2006 by Kickoff Magazine. It was the same season he won his last cap for Nigeria, on 16.11.2005 against Romania. As far as I know this is his only match for his country. Nojeem is a former player of Enyimba FC and Sharks FC and is currently an important member of Kwara United FC. The brilliant left-back is described as follows: “His greatest asset is his overlapping runs. He has good work rate. He has a very good left foot that can hit the ball at a dangerous speed.” Nwabili had a stint at Espérance Sportive de Tunis(Tunisia) but joined Niger Tornadoes FC in 2007-2008, before becoming a key player at Enyimba FC. His date of birth is still not confirmed but it seems likely that he is born in 1987. Nwabili has actually forced his way into the current squad of the Nigeria national football team and has played two of the latest four matches, the last one being on 05.09.2010 against Madagascar. Nwofor was one of the revelations of the 2009-2010 season. He joined Shooting Stars FC halfway through the campaign from Anambra Pillars FC and managed six goals. Nwofor joined Rangers International FC before 2010-2011 and has scored three goals so far this season. His last name is sometimes written “Nwafor”. Nwofor is a powerfully-built forward or right-winger. He was a trialist at Norwegian side Molde FK during 2010. He played for Nigeria against DR Congo on 03.03.2010. In my opinion Oguchi has been the best right-back in the 2010-2011 Nigeria Premier League. Oguchi is a very attacking minded player who has already three league goals to his name. Oguchi made his debut for Nigeria on 27.05.2007 against Kenya and also played against Niger on 17.06.2007. Okonkwo joined Heartland FC before the season after three good seasons at Bayelsa United FC. Okonkwo played the last match for Nigeria, against Sierra Leone on 09.02.2011. Okonkwo has played several matches for Nigeria B, Nigeria U-23 and Nigeria U-20 during the last couple of years. He played for Nigeria U-23 in the “Olympic Football Tournament 2008”. Okoro is the current top goalscorer at Heartland FC with four goals. He joined Heartland FC from Bayelsa United FC before the current season. His date of birth is unknown but he played for Bayelsa United FC as early as 2006 and is most likely born in 1989. According to some sources, Okoro will join Norwegian side Stabæk IF during the next couple of weeks. He played the last match for Nigeria, against Sierra Leone on 09.02.2011. Olawale is a workaholic midfielder and arguably the best player at Kwara United FC. A great ball passer, the diminutive player is gifted in dead ball situations and he shoots freely with both legs. He played for Lobi Stars FC for several seasons before joining Kwara United FC before 2009-2010. His last match for Nigeria was against DR Congo on 03.03.2010. Oluwaniyi is currently the substitute goalkeeper at Shooting Stars FC. Formerly of Gombe United FC, Rangers International FC, Nasarawa United FC, Dolphins FC and Sharks FC. Oluwaniyi was voted as one of the top 10 goalkeepers of Nigerian football in January 2006 by Kickoff Magazine. He played for Nigeria against DR Congo on 03.03.2010. One of the most interesting players on the list. Otekpa is described as a very promising playmaker and as a petit midfielder. He is a star player at Enyimba FC after joining them from Lobi Stars FC. Otekpa played his last match for Nigeria on 05.09.2010 against Madagascar. As far as I know, Rotimi’s last match for Nigeria was on 31.05.2004 against Jamaica. Rotimi is a giant goalkeeper who played professionally in Israel before re-joining Dolphins FC in 2007. He is first choice goalkeeper at Dolphins FC and has produced an impressive number of clean sheets this season. Saka was presented in my post from 06.11.2010. The playmaker is still red hot but wonderboy Christopher Chigozie (5 goals in the three latest matches) has taken some of the spotlight from Saka. Saka played for Nigeria against South Korea on 11.08.2010. It’s more than 10 years since Salaudeen played his last match for Nigeria, on 07.10.2000 against Madagascar. The experienced right-winger has been with Olympique de Béja(Tunisia),Al-Ittihad(Libya) and ES Setif(Algeria) before he joined Gombe United FC in 2009-2010. Shaibu was an important member of the Nigeria-squad for the FIFA U-17 World Cup 2001. He scored 3 goals during the tournament. The only full international match I have recorded for Shaibu was on 06.06.2000 against Malawi. Shaibu is currently a fringe player at Shooting Stars FC but has scored one league goal. Formerly of Bendel Insurance FC, Heartland FC and JUTH FC. Showemimo was presented in my post from 27.10.2010. The brilliant central defender made his debut for Nigeria on 09.02.2011 against Sierra Leone. Thankgod is an experienced defender and the former captain of Heartland FC. His biggest assets are his strength and aerial power. Thankgod is a key player at his new club, Warri Wolves FC, but will most likely join a foreign club during the current or next transfer window. He played for Nigeria against DR Congo on 03.03.2010. 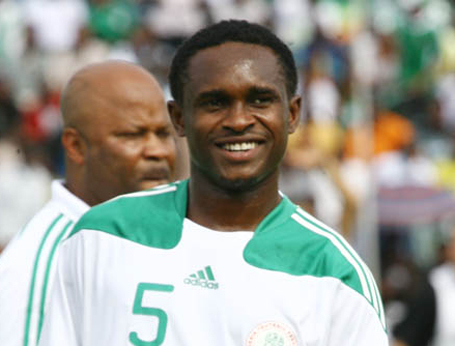 Tyavkase is one of the most experienced attacking midfielders in Nigerian football. He was a key player for Enyimba FC as early as 2004 but played for Lobi Stars FC in 2007-2008 and parts of 2008-2009. He played for Enyimba FC in the “Champions League 2004”, the “Champions League 2005” and the “Champions Cup 2006”. Tyavkase played for Nigeria on 16.11.2005 against Romania. Creative midfielder who is a key player at Heartland FC. He is known for his sublime skills and all-round ability. Ubido played for Lobi Stars FC in 2004. The brilliant midfielder made his debut for Nigeria on 09.02.2011 against Sierra Leone. Udoh was one of the heroes of Nigeria’s Golden Eaglets (Nigeria U-17) who won the 2007 World Cup. Udoh is one of the most promising central defenders in Nigeria and made his debut for Nigeria on 09.01.2008 against Sudan. Currently an important member of the defensive line of Heartland FC. Dear Sir, please can you help me with about one of the Nigerian League player his name is Fayose Fashanu John of Crown of Ogbomosho i will like you to update me with information about him. This was also my theory from the moment I found his name in Yearbook of African Football 2010 by Gabriel Mantz. “Nofiu Taiwo” is listed there as a midfielder playing for Sunshine Stars Akure in 2008/09 season. It seems he joined 3SC thereafter. Anyway, I’ve managed to find that piece of information I’d mentioned last time claiming Felix Ogbuke played against Angola. It’s an article with coach Musa Abdullahi’s quotes from October 2003. Maybe this would be helpful for your database too. I know that a player called Nafiu Taiwo scored 5 league goals for Sunshine Stars FC in 2007-2008. He was also part of the Nigeria B national football team in 2008. I have a theory that this is the same player as Hassan Taiwo (born 20.01.1989), a left-winger at Shooting Stars FC, but I am not able to confirm this. I am pretty sure that Taye Taiwo did not play against DR Congo. The match against Angola on 21.06.2003 is actually one of few matches I cannot find line ups from. So I am sorry to say that I cannot confirm this. I didn’t know about the second Barnabas Imenger – now I even found he’s a son of the past Super Eagles player. Nice. I think you are correct regarding Emma Godwin. Thanks for bringing this to my attention! Barnabas Imenger who played for Nigeria is actually a different player then Barnabas Imenger who currently plays for Kwara United FC. The Kwara-player is a very promising teenage striker, signed from the Kwara Football Academy at the end of 2010-2011. He scored for Kwara United FC this weekend. When it comes to Amaefule and Nwafor, my source is Kickoff Nigeria and the following link. I find this page trustworthy when it comes to Nigerian football. I know that Onuh played for Nasarawa United FC in 2007 but have no record of the player after this. I’ve been doing a similar research on Nigerian international capped players, trying to include as many B, U-23, U-20 and U-17 matches as I can. I think Emmanuel Godwin, Dolphins’ defender is missing from your list. He played last 5 minutes against Ghana (3:1) on 31th May 2003 according to my research. Also Barnabas Imenger from Kwara Utd played for Nigeria senior team but earlier than the start your database (1993 to 1995). Are you sure that Amafule and Nwofor played against DR Congo a year ago? Soccerway or Soccernet claim they didn’t but Footballdatabase states they did. Anyway, it’s a fantastic work 🙂 Maybe we could exchange the results of our researches someday. Greetings from Poland. what became of Emma Onu, the Berger midfielder who got capped as a sub (the ONLY sub) in the 2005 Romania game?